Inside southern entrance to Portland Harbor, at the end of a quarter mile jetty. Portland Harbor Museum (originally the Spring Point Museum) and Fort Preble Park where the lighthouse is located are open to the public during the tourist season. 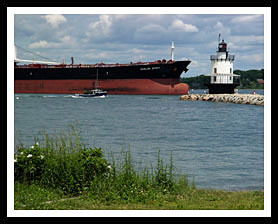 Prior to the building of Spring Point Lighthouse, many ships would find themselves stranded on the ledge that runs from Fort Preble out to the main ship channel. Though many managed to free themselves at high tide, others perished. On September 7th, 1832, the Nancy, a lime coaster out of Rockland hit the ledge and burst into an uncontrollable fire caused by the salt water combining with the lime. Public outcry caused a huge buoy to be placed at the point, which didn't prove very effective during New England stormy weather, as accidents still occurred. The most well known of these accidents occurred when the nearly 400 ton vessel, the Harriet S. Jackson, ran aground during a fierce gale storm on March 21, in 1876. Luckily all the crew survived. Spring Point Ledge Light, after many a public outcry, was finally built in 1897 on that treacherous ledge a few hundred yards off shore, it was originally surrounded by water. 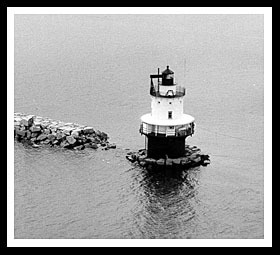 In 1951, a 900-foot long breakwater consisting of 50,000 tons of granite was built leading to the lighthouse. One of Spring Point's Keepers, Aaron Wilson, gained fame as one of New England's most accomplished carvers of wooden bird decoys. Visit the Portland Harbor Museum, once called the Spring Point Museum, which is located inside Fort Preble, which also allows access to the lighthouse and its grounds. The jetty that leads to the lighthouse is a nice walk with plenty of opportunity for fishing off the rocks, and Fort Preble gives families a chance to explore. There is also a tiny beach area to relax at and watch the boating traffic coming in and out of Portland. The Lyric Music Theater in South Portland is open year round. Portland is one of the largest seaports in New England, Maine’s largest and arguably most cultural city, offering lots of specialty restaurants and shops, artist galleries and museums to visit. Visit the historic Old Port district with lots of nineteenth century architecture to discover, boutiques and many restaurants to choose from. You can also follow various urban Portland Trails through the city. One waterfront park called the Easter Promenade provides nearly seventy acres of water views and recreation. There are some interesting museums to visit as well. If you happen to look at Portland’s skyline you may see what appears as a red lighthouse on a hill. The Portland Observatory is the only known remaining historic maritime signal tower in the United States. Visit this unique museum and you’ll great some great views of the harbor as well. For the sports enthusiasts, take in a minor league baseball game at Hadlock Field, home to the Portland Sea Dogs of the Eastern League. If you visit during hockey season, grab tickets for the Portland Pirates minor hockey league, affiliate of the Florida Panthers at the Cross Insurance Arena. From US Route 1 take exit 6A and bear right onto Broadway St. in South Portland. Stay on Broadway to Pickett St. and turn right then left onto Fort Road, which ends at Fort Preble. You can also follow along Route 77 from Fort Williams State Park (Portland Head Light) and take a left onto Broadway to Pickett Street to the end, then left onto Fort Road. You'll also find Spring Point Museum. Boat tours mentioned below offer many types of cruises. They may pass by Spring Point Lighthouse entering and leaving out of Portland Harbor, and may also pass by the lighthouse during charters, narrated wildlife and historic tours, fishing tours, and other types of excursions. Ride these amphibious vehicles through Portland and as they pass by Portland Breakwater and Spring Point Light. 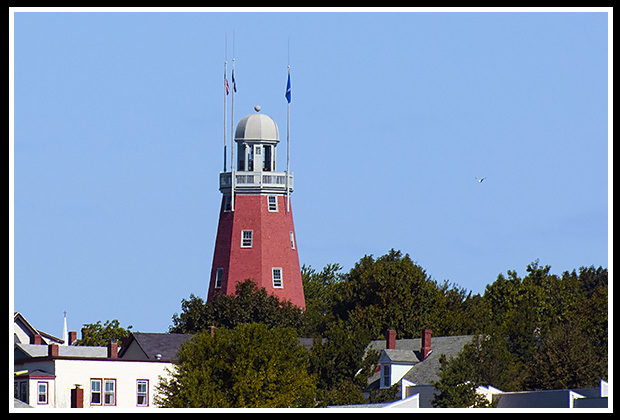 Use Bailey Island Cruise to view lighthouses on some occasions. Lobster boat cruises that may pass by Spring Point Light. Can also request special excursions. 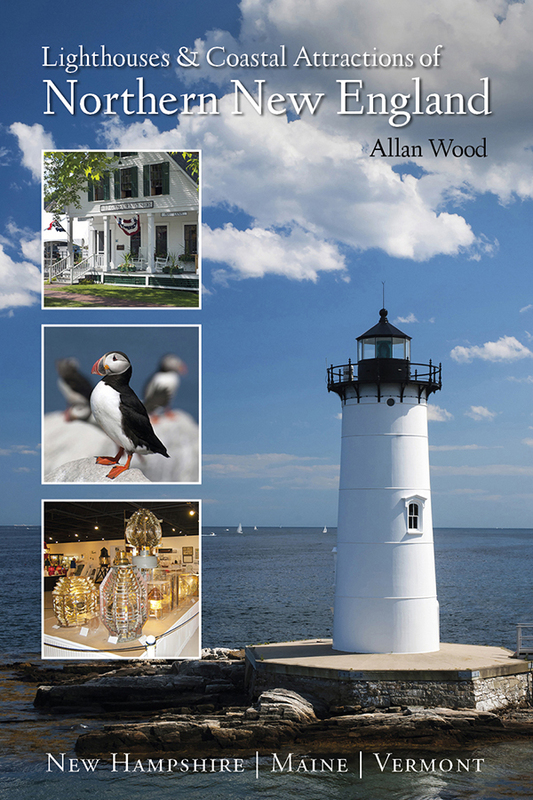 My 300-page book (with over 360 images), Lighthouses and Coastal Attractions of Northern New England: New Hampshire, Maine, and Vermont, provides human interest stories from each of the 76 lighthouses, along with plenty of coastal attractions and tours near each beacon, and contact info to plan your special trips.